There are a variety of foods to give your chickens. I bring their feed out each morning (I usually lock the feeders away at night in the coop to keep it dry and away from pests), ensure that it is clean and full. It’s important to keep the feed dry as damp feed can develop mould which could be harmful to the hen. I use layers pellets but both types should provide you hen with the essential nutrients to keep them healthy. I find there is less waste with pellets as the chickens tend to flick and scratch the mash mix out of the feeders. Feed usually comes in 20kg – 25kg bags and can range from £7 – £15 a bag depending on quality and if you wish to go organic. Layers feed can be found in most local livestock supply stores or at pet supermarkets like Pets At Home. A good quality feed should have a list of ingredients and what percentage of protein, ash, fibre, oils and vitamins it contains. I also keep an eye out to make sure it is GM-free. Some feed comes with added grit or oyster shell (source of calcium). If not, this is something you need to include. 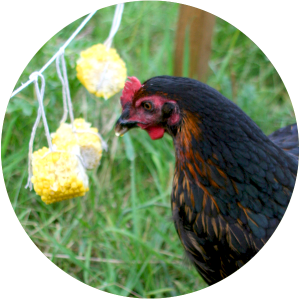 Chickens tend not to be greedy birds so you will be able to gauge how much feed they need. Feed should be stored in bins preferably galvanised and only be stored for 3 months. It is essential that grit is also either supplied in the feed or that the hens have access to a source. Chickens require grit to help their digestive system. Grit is stored in the gizzard and helps grind and breakdown the food they consume. If you buy a mash that provides a complete combination of nutrients, you need not bother with corn maize. This can be included in the feed as a treat and the chickens go mad for it! We usually add a handful of corn on a daily basis in the winter months to provide the extra energy needed to keep your chickens warm. This is a high protein feed usually given to chicks. I find in the period when the hens are moulting or if finding worms and other protein rich creatures are proving difficult (especially when the ground is frosty for long periods) I supplement the hens diet with some chick crumb. The protein improves the condition of the feathers and keeps the hens in tip-top health. 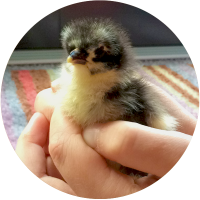 It’s also beneficial to include a small amount of chick crumb in the winter months. I’ve also found that ageing chickens (7 years+) sometimes struggle with the pellets, so I’ll give them some chick crumb and grit to keep them in good condition. Chickens will often welcome variety to their diet and treats always tend to go down well. Treats should be offered occasionally and again depends of the time of year. In the summer when grubs and greens are in most abundance you can give very few treats. Spoiling your hens too much may put them in risk of becoming overweight and therefore off lay and out of condition. When offering treats, I tend to dish them out later in the day after they’ve had their fill of the mash to ensure they’ve had some of their essential nutrients. You can give hens pretty much most things for treats. Live mealworm (can be bought online). Meat and fish scraps should not be given as this increases the risk of salmonella in the egg. An average hen requires around 200ml of water a day but obviously this increases during hotter periods in the year. Hens should always have access to fresh clean water. Even if hens are deprived of water for just a couple of hours, dehydration can kick in and will effect lay. Every now and then I add a splash of poultry tonic to keep the girls in good condition and other treatments can also be administered via their water.